Definitions. In order for two people to have a coherent and constructive discussion, they must first agree on basic definitions. Language itself is built on commonly held words and meanings. Christianity and Liberalism is a dictionary of sorts–one that seeks to define and distinguish two simple words: “Christianity” and “Liberalism”. This book, which is nearing its centennial anniversary, has never been more appropriate in an age where nuance, distinction, and clarity have sunk to a new low. Machen’s main objective it to bring about clarity where there is chaos. Liberalism masquerades as Christianity, and his desire is to demonstrate that liberalism is not just a branch of orthodox Christianity, but a separate religion–a works based system of feelings and optimism. In his opening remarks, J. Gresham Machen states, “The liberal attempt at reconciling Christianity with modern science has really relinquished everything distinctive about Christianity” (7). He believes it is nonsense to label “Liberalism” as “Christianity” simply because it has some minor similarities to it. 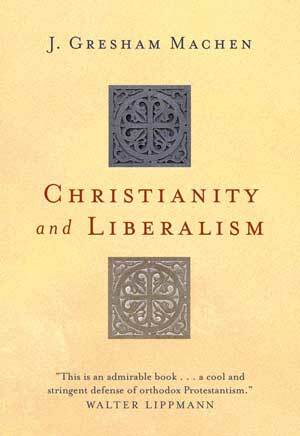 Machen first tackles the differences between Liberalism and Christianity on the issue of doctrine. Liberals are leery of being nailed down to any particular doctrine; instead, they prefer to speak in broad terms that allow for individual expression and discovery. However, the author questions, “Is it really doctrine as such that is objected to, and not rather one particular doctrine in the interests of another?” (18). He points out a favorite liberal aphorism, “Christianity is a life, not a doctrine.” Yet the gospel is “good news”–news about historical events, namely the life, death, and resurrection of Christ. Any interpretation of these event is doctrine, according to Machen. Thus, “‘Christ died’—that is history; ‘Christ died for our sins’—that is doctrine. Without these two elements…there is no Christianity” (27). Machen notes that many liberals cultivate trust in Christ as a person without a necessary faith in His message or purpose. They wish to, “…now return to that simple trust of the disciples…[let us] cease to ask how Jesus saves” (39). Machen argues that to return to the immature faith of the disciples before Christ’s death would be to erase the wisdom and faith of nineteen centuries of Christian brothers and sisters, including the New Testament Scriptures. The author points out a logical analogy: “In no branch of science would there be any real advance if every generation started fresh with no dependence upon what past generations have achieved” (46). Christianity is a religion built upon the eyewitness testimonies of those who went before. To remove oneself from the testimonies of other believers is to remove oneself from Christianity. “Jesus had practical, not theoretical, knowledge of God,” and, “We become acquainted with God only through Jesus” (55,56). Machen claims that these prevailing liberal attitudes ignore the fact that God has given both general and special revelations to reveal His character and divine attributes. Liberal preaching is equally deficient in both understanding of God and understanding of man. Machen argues that liberal preaching starts with optimism about man’s state–that he is basically good, while true Christianity begins with the core sinfulness of man and moves to the free grace of God in Christ Jesus. Machen asserts that the liberal movement has conceded the historicity of the Bible. Machen notes that many liberal preachers will ask, “Can we not find, instead, a salvation that is independent of history, a salvation that depends only on what is with us here and now?” (70). Strongly disagreeing, Machen insists that the content of the gospel is the narration of an event; if that event did not happen, then there is no gospel. Liberalism also denies the inspiration of Scriptures, claiming that the authority of Christ rather than the authority of the Bible holds sway in their lives. Machen argues that this perspective gives the individual an improper power to dictate what is true for himself as he decides what the historical Christ actually said. Machen distinguishes the Christian belief that Christ is the object of faith from the liberal belief that Christ as an example for faith. “According to modern liberalism…Jesus was the Founder of Christianity because He was the first Christian, and Christianity consists in maintenance of the religious life which Jesus instituted” (85). If Christ is only an example, he is a poor one to follow because He claimed to be much more. Liberalism views Christ as the best product of humanity, while Christians believe Christ was God. Throughout the book, Machen does a great job in showing how the Gospel is at stake. This discussion is not a mere quibbling about certain unimportant doctrinal issues; rather, it is a matter of salvation and death. “For Christianity depends, not upon a complex of ideas, but upon the narration of an event. Without that event, the world…is altogether dark, and humanity is lost under the guilt of sin.” Machen’s careful dissection shows his readers that liberalism is actually paganism cloaked with Christian jargon. According to liberal preaching, man no longer needs a Savior, but it is nice that Christ has given us a good example of how to live. Christianity and Liberalism makes theses issues relevant to every believer. Machen frequently reminds his readers that this is not merely an academic debate: “[Liberalism’s] attack upon the fundamentals of the Christian faith is being carried on vigorously by Sunday-School ‘lesson-helps,’ by the pulpit, and by the religious press”(17). Machen’s book is meant to make all believers aware that not all preaching is as it seems; the common Christian cannot be deceived by intentional vagueness or misuse of terms. By including typical catch-phrases and buzzwords, Machen gives the common Christian the tools he or she needs to quickly recognize liberal agenda in the pulpit or on the bookshelf. At times, Machen can drift from the topic at hand. The chapters have distinct titles like Doctrine, God and Man, and Christ, but Machen does often blur topics and discuss issues across chapters distinctions. There is also a large section of Machen’s introduction where he denounces the developing public education system of his day. The issue does relate to the modernization of society; however, the length of his discussion and the amount of detail poured into the topic seems out of place for an introduction to a debate of Christianity and liberalism. Machen’s conversational style can be a blessing and a curse. While it helps his readers feel like they are listening to a friend, at times it hinders the clarity of his argument. He often asks questions or makes assertions using the voice of liberalism, and this could confuse a reader not previously acquainted with the issues at hand. At times, Machen is not completely clear in articulating liberal beliefs, which makes it difficult for his readers to come away with a succinct understanding of liberal theology. This may be due, in part, to the fact that liberalism is a fluid movement whose proponents often do not agree on the particulars of their theology. Liberalism is a theology designed by the individual Christian consciousness, and this makes it difficult for anyone to give a specific list of beliefs held by the liberal movement. I would have appreciated a discussion concerning the specific denominations and regions of America that were most susceptible to liberalism in the 1920’s. Additionally, Machen does not address his opponents by name in his book, which for Christian charity’s sake might be a measure taken by the author out of love. However, it is often advantageous for the reader to be offered names of other authors who oppose Machen in the debate so that by reading their works the conversation could gain further clarity for those interested. Christianity and Liberalism is as applicable, if not more, as it was when first penned in 1923. These same issues are creeping back into our churches through influential writers like Rob Bell. This book is a great resource for pastors who wish to provide a succinct discussion of the liberalism debate to their congregations, and its style is extremely readable. The issues discussed in Machen’s work not only help to clarify the thoughts of the reader, but they also help him to search out any false belief that might be found within him. It is always good for Christians to learn from Christian pillars of the faith, and J. Gresham Machen’s stellar book provides great encouragement and support for the modern era.